Commander Eric Tufnell RN (1888-1979). Watercolour signed and annotated HMS BIRMINGHAM. The last Southampton Class cruiser to go out of service, HMS BIRMINGHAM (Captain S H Beattie VC RN) is seen here wearing the flag of the Commander-in-Chief Mediterranean Fleet, Admiral Sir Charles Lambe KCB. Distinctive by her bows which unlike all the others in the class was not a "trawler" bow (ie it had no knuckle built into the flare for'rard), BIRMINGHAM had had a hard war and saw service all over the world. By this stage in her life (late 1950s) she was wearing out but nonetheless made, we are told, a very successful flagship for her last commision which was in the Med. 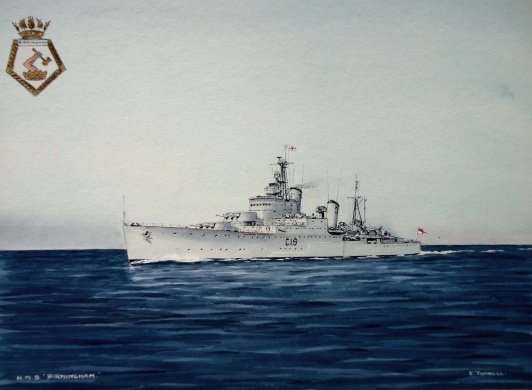 In her final summer out there she was in collision with the destroyer HMS DELIGHT (Captain P G C Dickens DSO MBE DSC RN) and although the material damage in both ships was slight (DELIGHT managing to put her wheel hard over at the last minute and reduce the angle of impact), there were casualties. The improved Southampton Class cruiser HMS BELFAST remained in commission for a further 4 years or so after BIRMINGHAM paid off in late 1959.